After becoming a Christian in Marine Corps boot camp at 18 years old, I felt the call to pastoral ministry just one year after my conversion. I committed to the ministry of my Assemblies of God congregation and pursued lay ministry there until I returned to college and graduated from Eureka College with a Theological Studies degree in 2005. I learned to love theology and so continued to pursue an education in theology, earning a Master of Theological Studies from Garrett Evangelical Theological Seminary (2007) and a Ph.D. in Theology and Ethics at Garrett (2014). After graduating from a Disciples of Christ college and a United Methodist Seminary, I was originally ordained in the Assemblies of God. In 2016, I left the Assemblies of God to become an ordained Elder in the United Methodist Church. This ecumenical background has opened many doors as I speak across a number of Christian traditions. While in seminary, I served in Youth Ministry, Young Adult Ministry, and Worship Ministry in congregations in Wisconsin and Illinois. I have written on Pentecostalism, liturgy, prayer, and apologetics in academic and professional journals. I recently published my first book on the implications of postliberal theological method for the discipline of apologetics (Apologetics after Lindbeck). But I have been leading retreats for high school and college students for several years on vocational discernment and the theology of calling. I plan to write my next book on this topic. I have served since 2009 as University Chaplain at the University of Indianapolis. Besides leading campus ministry programming and providing pastoral care at UIndy, I also am the Director of the Lantz Center for Christian Vocation and Spiritual Formation. In that role I teach courses in spiritual formation, youth ministry, and theology. I am married to the Rev. Jenifer Stuelpe Gibbs, who is Senior Pastor of Old Bethel United Methodist Church in Indianapolis. We adopted our son, De’Avalon, when he was four years old. I learn as much about faithful discipleship from the two of them as I have from studying theology. Jeremiah Gibbs is one of my favorite commentators on the intersections of Christian faith, culture and justice in the 21st century. 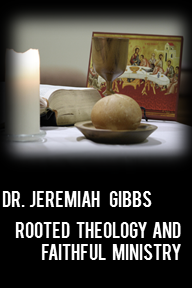 Ordained in the charismatic Assemblies of God tradition and working as a chaplain at a United Methodist college, Jeremiah’s work speaks poignantly to a broad swath of American Christianity. Good news, thanks! Have you read Equally Yoked by Rick McKinnes? This book makes the case for women in leadership. Right now we are rowing with one oar. I just completed reading “The Day That I Started To Understand Racism” from my FB News Feed in which I searched your site. Rev. Gibbs, as a black male, I am a huge advocate against racism, and your writing brought tears to my eyes. Currently, I am a Ph.D. candidate focusing on “The Relationship between Emotional Intelligence (EI) and Effective Leadership.” According to your writing, you stated, “I think that I can also straightforwardly say that African-Americans treat me differently when they see me with my son. I don’t know how to explain the boundary that exists between many (BUT NOT ALL) black and white persons. But somehow seeing me with my son helps me get past that boundary many times.” When African-Americans see you with your son, one of the reasons they may treat you differently because of belief, which is one of the components of EI according to Goleman (1998). When people have the same beliefs, those beliefs help pass the boundaries due to a common denominator. This relationship is also factual between leaders and employees when accomplishing challenging tasks. The employees must have the same beliefs as the leader in order to accomplish the organization’s perplexing tasks. However, when there is not a common denominator, people (leaders and employees) will most likely go in opposite directions. In other words, African-Americans may treat you differently because they believe that you understand racism or their journey due to your African-American son. Thanks for sharing “The Day That I Started To Understand Racism”. Again, I really enjoyed your writing and please have an awesome day, Rev. Gibbs. Goleman, D. (1998). What Makes a Leader? Harvard Business Review, 1-10. Jay, thank you so much for your response, and Jeremiah for speaking about that difficult-to-describe boundary. I have a biological bi-racial son, and I’ve experienced that boundary myself. It feels so odd to me to experience both sides of it – both being accepted (because of that shared belief you describe, Jay) and being not accepted because I show up somewhere without my son. Sometimes I feel as though I need to bring him with me so that I can prove the validity of my opinions or experiences, as though I’m having to say, “Look! Really! I DO understand!” And it makes me sad and a bit discouraged to realize that my white privilege puts me in a position to address my white peers from my experience, and to be an ally for Blacks, but excludes me from having a mutual denominator with my Black brethren and sistren. I appreciate your thoughts on race. It was really touching. I am a black man who has worked in many settings, even Assemblies of God before. I appreciate what you do for the kingdom of God, and for society. May others learn from your experiences. BTW…I’m here from a post on my facebook news feed by Michael Baisden. Just stumbled on your blog and love it! It seems both of us have similar interests and topics we write. I agree with other commenters. Such a great post.